There are many spots in Berlin where you can find beautiful sights. 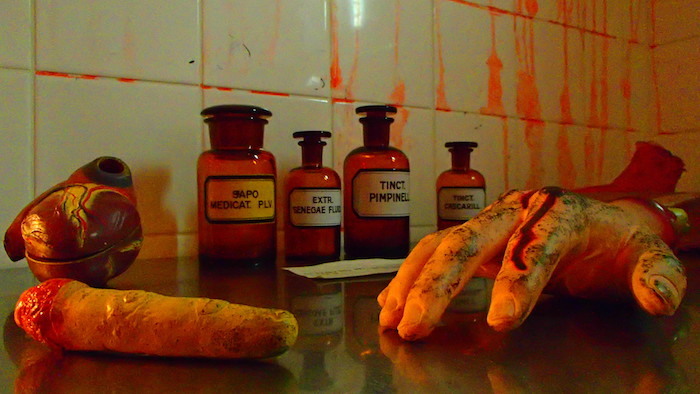 In the article “Some great photos from Berlin” you could already see some impressive photos of touristic attractions. But besides sights and interesting architecture Berlin also has it’s own typical style. In the photo-compilation of today we have collected 10 photos which fit to the topic typical Berlin. The photos represent Berlin as the unique and special city it is. A few months ago we already posted an article with some typical photos of Berlin. The article was called Berlin at it’s best and now we follow up on that collection of photos. The 10 photos capture the special ambiance of Berlin and why it is one of the best cities to live in when you young and open-minded. 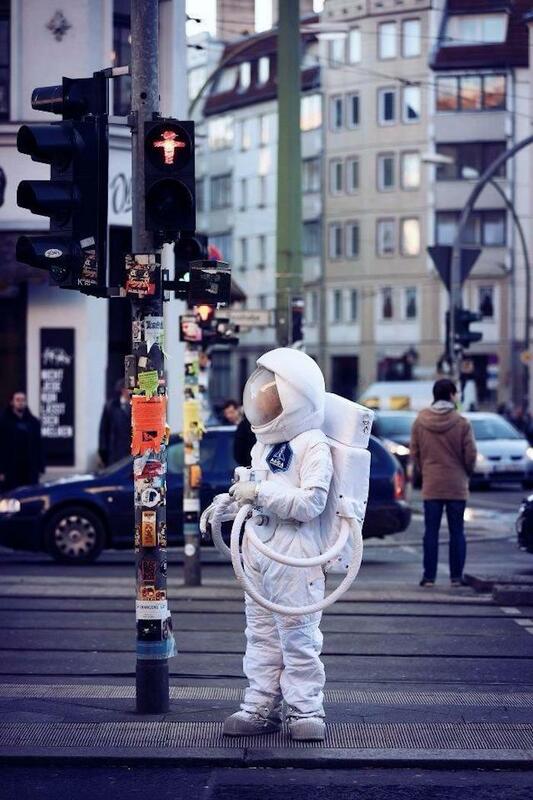 Astronaut in the middle of Berlin (© https://www.facebook.com/OpenAirBerlin)This photo was taken in the middle of Berlin. Thumbs up for the man in the costume. Off course it is possible that it is just a bet of a group of friends with a good sense of humor, but as long as you make other people smile you are a small hero to me. Wish I could meet somebody like this everyday on my way to work. Streetparty in Kreuzberg (© randomjack.tumblr.com)This photo was taken during Karneval der Kulturen in Kreuzberg. 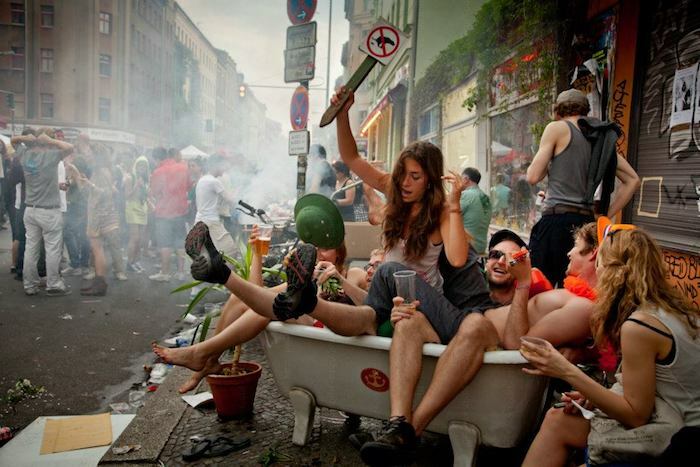 It captures the insane possibilities of Berlin: There is a bathtub with 5 people in the middle of the street and the group of people behind the bathtub does not even act surprised. The alternative parties with funny attributes and open-minded people fit to typical Berlin and make the city an awesome place to be. 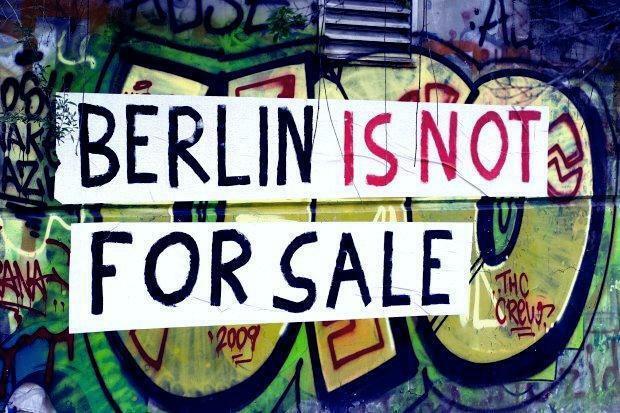 Berlin is not for Sale (©web90.s07.speicheranbieter.de)This photo has it’s own little history: The photo sends the message that Berlin is not for sale and it will never be for sale. But unfortunately money rules our world and some gorgeous parts of Berlin have been sold in the last couple of years already. A few months ago a part of the East Side gallery was taken down because companies have plans to build something on the waterside over there. Lucky enough there are many Berlin-lovers who try to stop the city from being sold and that is exactly what this photo tells us. 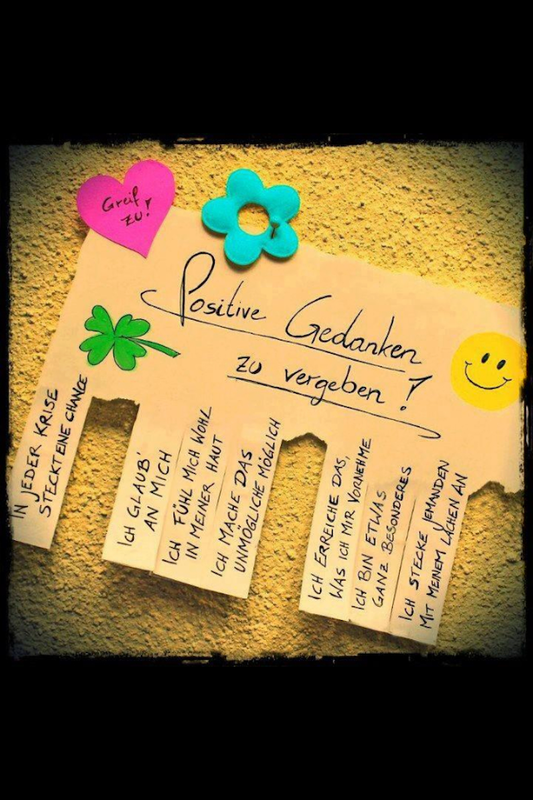 Positive Gedanken zu vergeben (© irenesoeding.blogspot.com)This image itself might not be particularly special, but the message is just, in proper German, wunderschön. Sometimes when you walk around in Berlin you can find these kind of cute messages on traffic lights or walls. This one was made to give free positive thoughts to pedestrians. You can chose one the thoughts and hopefully is cheers up your day. Examples of the thoughts are “I feel good in my body” and “I am something special”. Message to the writer: Please never stop with these kind of beautiful messages! They are absolutely beautiful! Awesome guy on a bridge in Berlin (© https://www.facebook.com/OpenAirBerlin)What can we say about this typical photo of Berlin. 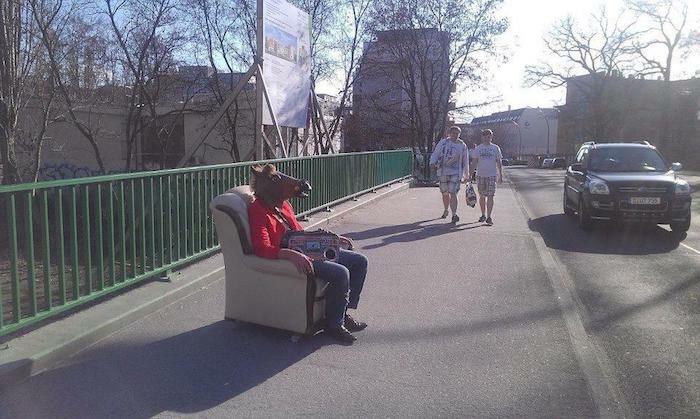 People like this make the city fun and make people laugh who see them sitting there in the middle of a bridge. Simply awesome. U8 Kottbusser Tor (©blog.bohlwegstudios.com)Not all parts of Berlin are as safe and charming as others. 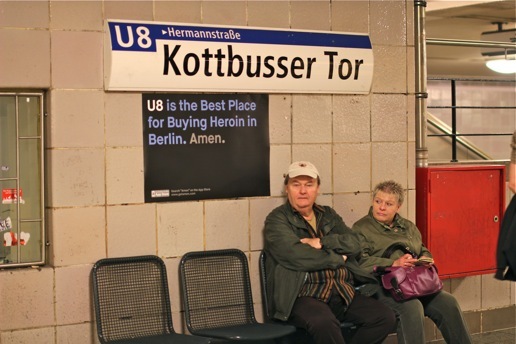 The picture shows the U8-station at Kottbusser Tor and this part of Berlin is known for the fact that it not very hard to buy drugs here. But it is defenitely typical Berlin that you can find this text on the wall in the middle of the station: U8 is the best place to buy Heroin in Berlin. Amen. . This sign it part of many signs of many Guerilla-Marketing signs which can be found all over Berlin. Other signs are Revaler Straße is the Best Technostrich Ever. Amen. and Hasenheide is the best place for buying organice homegrown greens in Berlin. Amen. Jack Nicholson on a wall in BerlinOf course a list of typical photos from Berlin should also have at least one photo of some Street-Art. You can enjoy this free art all over Berlin and it defenitly contributes to the beauty of the city. In my article about street-art in Berlin you can find more information and photos about this topic. 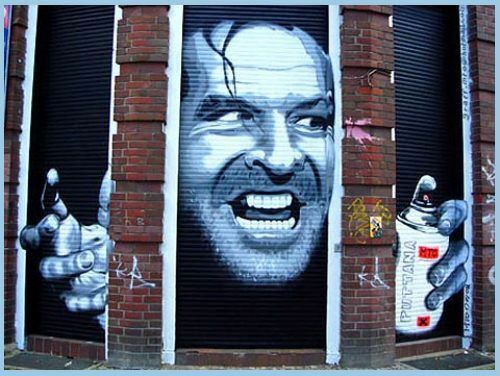 This painting of Jack Nicholson is a famous one. East and West Berlin from out of Space (© http://failblog.cheezburger.com/)A few months ago this photo popped up on the internet. It is a photo from Berlin, taken from out of Space. 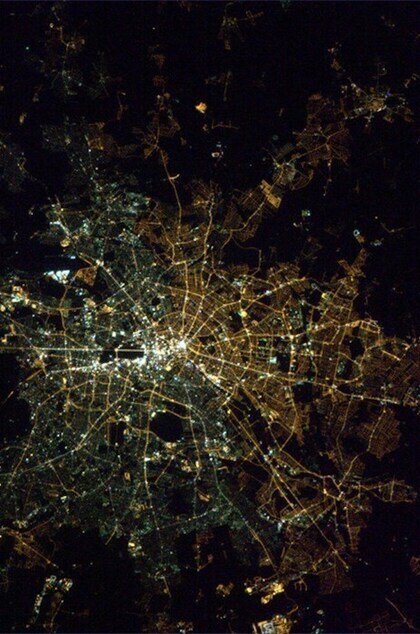 It clearly shows the difference between east and west-berlin and that makes this photo pretty special. The wall and its history will always be connected to Berlin. 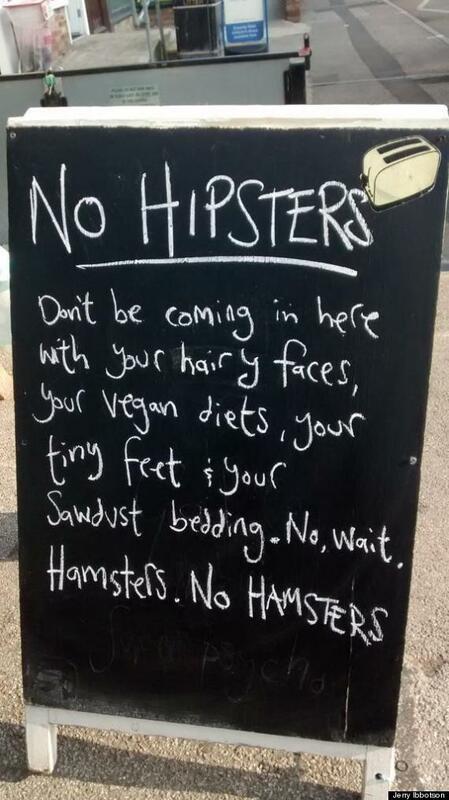 Hipster or Hamster? (© huffintonpost)Hipsters are closely connected to typical Berlin. Lucky enough Berlin also has plenty of humor and that is what you can read on this chalk-board. Hopefully this bar-owner gets some extra visitors because of this hilarious message. Barbie Dreamhous Experience in Berlijn (© zuhloo.de)Besides a lot of possibilities and freedom, Berlin is also a city of demonstrations. Maybe it is not typical Berlin but typical human that there are always people who are pro and against specific kind of things. In a capital-city you just realize this more I guess. The photo above has been taken close to shopping-center Alexa. Since a few weeks you can find the Barbie Dreamhouse Experience there. 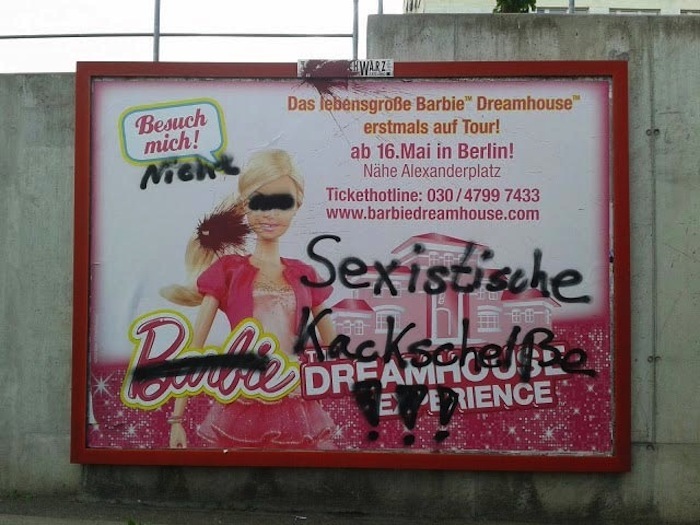 The text “Sexistische Kackscheiße” does not need to be translated and shows that not all habitants of Berlin think that small girls should have Barbie as their main-example in their youth. Hopefully you enjoyed the 10 photos from Berlin and if you have any photos who fit to the topic: typical Berlin, please leave a comment. I know U8 and Kotti very good, this place Kill Me and my life.